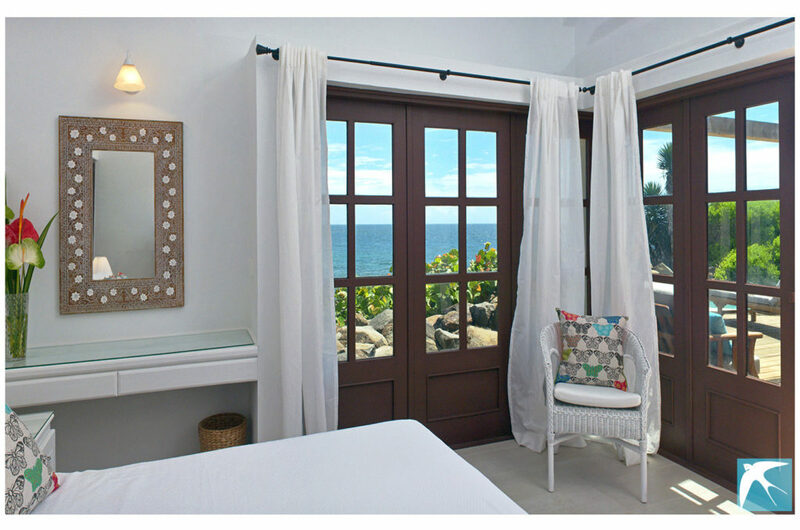 Hirondelle is a modern and stylish villa located directly on the ocean on the West Coast of Grenada. 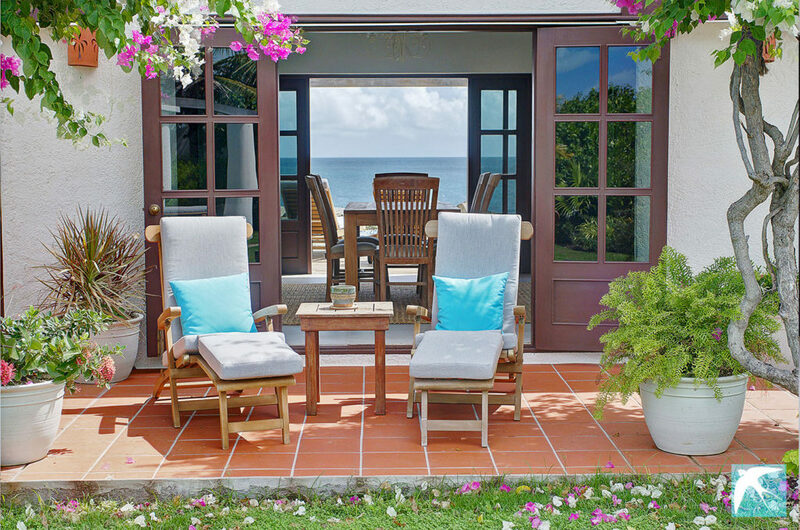 Guests can sunbathe in the privacy of the walled garden, around the plunge pool, or relax on the shaded terrace with a cool drink, whilst still enjoying the ocean view. Located in the upscale neighborhood of Lance Aux Epines, Hirondelle is a contemporary property with a modern edge. Relax and rejuvenate in the splendor of the chic tropical atmosphere. Within the convenience of its location you will be ideally situated for a fun-filled, relaxing holiday in the sun. Hirondelle features earth tones and a stylish design and warmth. 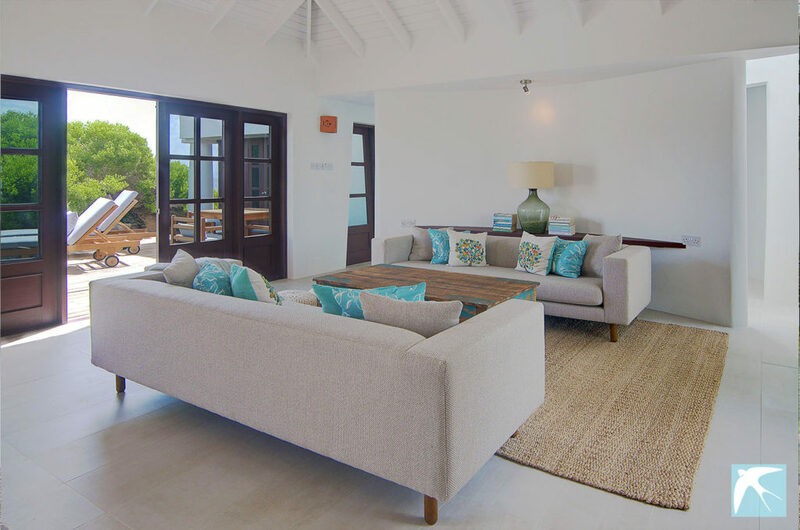 Benefiting from year-round breezes, the open design creates a naturally cooled living space with doors which open to the splendid panoramic views of the sea or the lush garden. The large living room includes a seating area with comfortable sofas, a dining table and an open gourmet kitchen. The living and dining areas maximize the indoor/alfresco lifestyle by providing easy access to the outdoor areas. The kitchen comes fully equipped with lots of counter space. 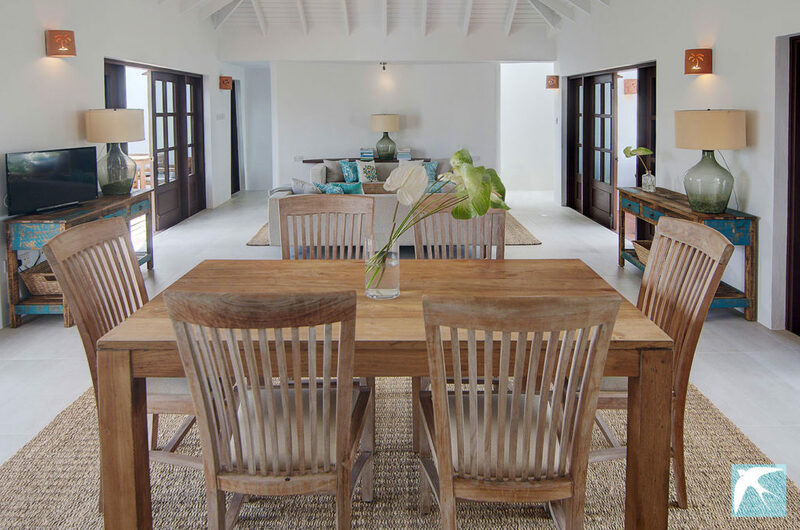 The villa can accommodate up to six guests. Due to the rocky, seaside landscape and dramatic coastline of the villa it is not suitable for young children. 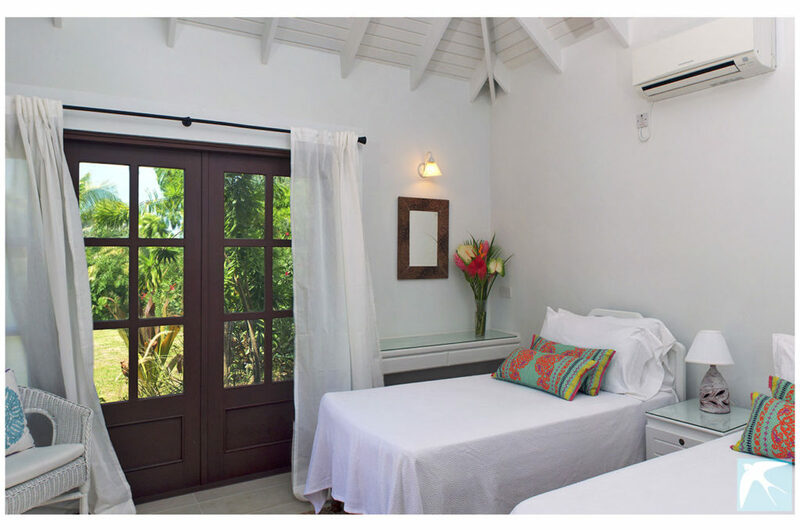 Each of the bedrooms include an en-suite bathroom, air conditioning and pool or garden access. One of the unique features of the villa is the private walled garden area designed by John Criswick. Criswick’s home is the St Rose Nursery of Tropical Plants, described by the American Horticultural Society as, “the most extensive nursery in the Caribbean”. Set in the Grand Etang rainforest overlooking Mount Maitland, the nursery is home to rainbow-coloured tibouchinas, strelitzias and heliconias, which bloom in the lush greenery. It is plants such as these that Criswick has provided for past exhibitions by Grenada at the Chelsea Flower Show in London and that we are lucky enough to have in our garden. 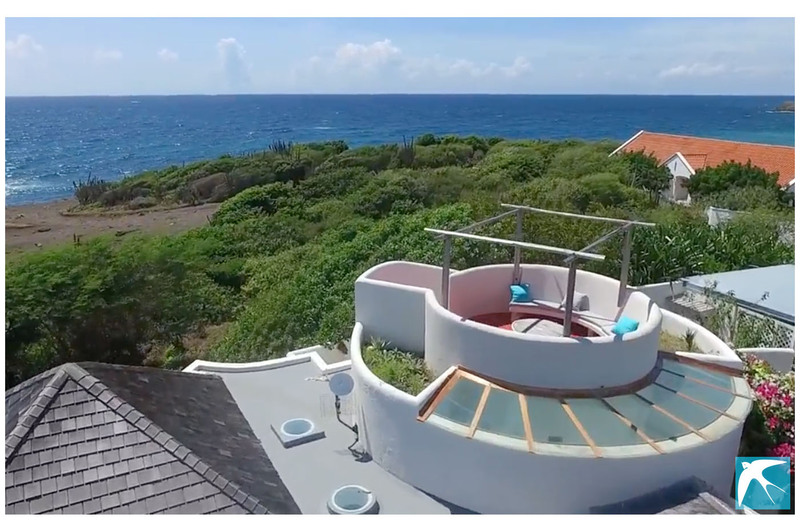 Additional features include a large plunge pool as well as a sunset turret. 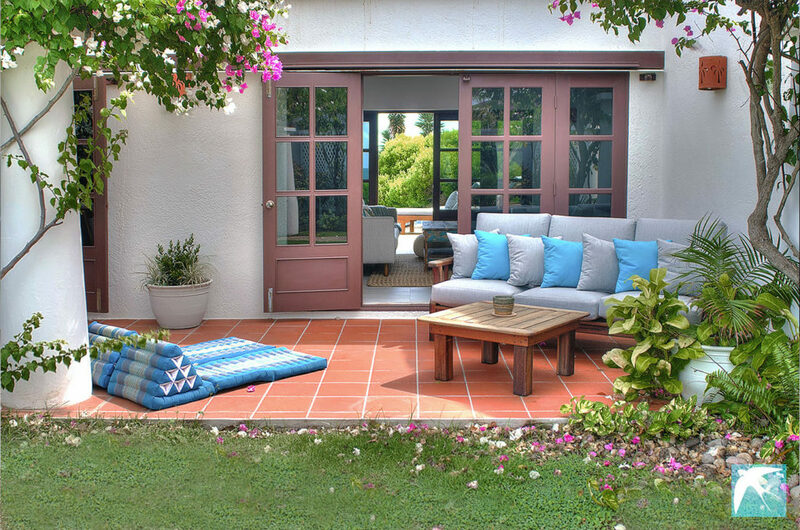 The turret gives you a bird’s eye view of the coastline with a lovely outdoor seating area with cushions. A sun deck with teak loungers frames the infinity pool as well as an alternative sun deck closer to the water’s edge. As the days wind down, recline with your favorite cocktail and enjoy the magical sunsets at Hirondelle Villa! Two single beds are in this bright bedroom which opens onto the enclosed garden. 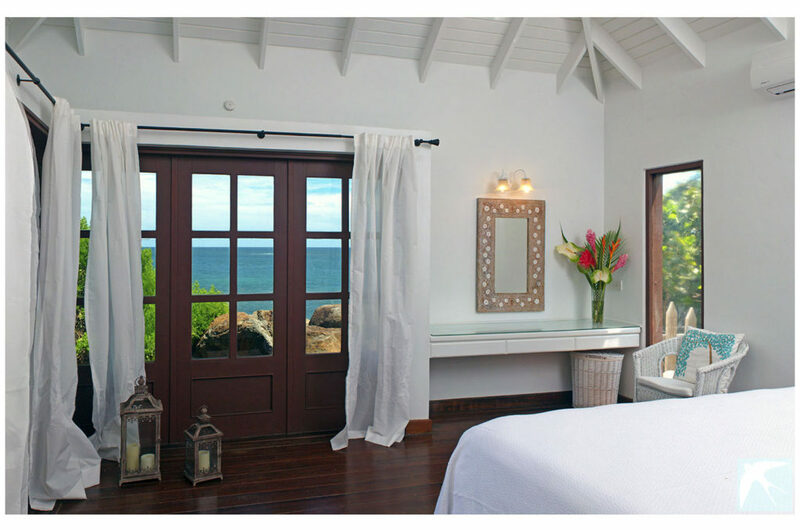 This bedroom features an en-suite bathroom with shower, air-conditioning and ceiling fan. This guestroom features a queen size bed and its own private ensuite bathroom with shower, air-conditioning and ceiling fan. Large windows face directly towards the ocean. This bedroom opens onto the main terrace and pool deck. Located on the other side of the villa this is the largest bedroom featuring a king size bed, en-suite bathroom with large shower, air-conditioning, ceiling fan and safe. This bedroom opens onto the main terrace and pool deck. Located in the upscale neighborhood of Lance Aux Epines there are a wide choice of excellent restaurants in the vicinity. The world famous Grande Anse beach is 5 minute drive away, as is Spiceland Shopping Mall which houses Real Value IGA Supermarket. The town of St Georges is 15 minutes away. Maurice Bishop International Airport is very close and not even a 10 minute drive away. Maid and laundry service is provided three days during your weeks stay. If you require daily housekeeping services or a cook we can certainly arrange that for you and provide you with the cost. Please refer to The Island section for recommendations of things to see and do, as well as places to eat. Booking Periods: A 7 night minimum stay is required during the Festive Season. Rental Notes: Smoking is only permitted in outdoor areas. Children are welcome at the villa over the age of 8. Maximum 6 guests. Deposits: 50% of total booking at time of reservation. Balance due 30 days prior to arrival. Cancellation: We will refund your deposit if you cancel more than 60 days prior to arrival in winter season and 30 days in summer season less a 10% hold back. We recommend guests take out travel insurance to include possible loss of deposit. No shows will result in a full forfeit.